A bookmaker, bookie or Turf Accountant is person or company that collect bets for sporting events. Bets are placed and winnings are paid when the chosen team wins or event happens. The most popular bet will be for winning team. If chosen team wins - person betting will win their money back with some earnings. 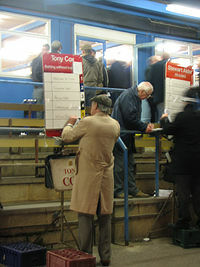 Bookmakers are very popular in UK and Ireland. The person betting can chose from many variations. Most bets are made in sports like football, horse racing and rugby. Some bets can be placed for events too, like Oscar or presidential winners. The first bookmaker was Harry Ogden opened in 1790s. ↑ "Bookmaking - gambling". Encyclopedia Britannica. ↑ Munting, Roger (1996). An Economic and Social History of Gambling in Britain and the USA. Manchester University Press. p. 89. ISBN 978-0-7190-4449-6.